-Intelligent to adjust moving direction within 10 milliseconds, powered by bionic algorithm. – High speed sensor allows VAVA remote vacuum robot make feedback within 25 milliseconds towards complicated environment. – Smart Memory: Low cleaning missing rate, bigger cleaning coverage with same battery capacity. – Unique U-shaped formation cleaning system, easily handling the edge and corner cleaning job. – Anti-drop, anti-collision sensors & durable protective bumpers keep the robot safe when cleaning. -120 minute battery life, auto-return charging, large wheels for climbing thresholds, requires minimal oversight or maintenance. – With 1300Pa of strong suction, triple-filter System & a large dustbox , just after one round cleaning, you can see and feel a new & clean home. – Suitable for use on hardwood floors, tile, laminate, and low- to medium-pile carpet. – To avoid entanglement, move cables out of the way. – Not suitable for high-pile carpet and wet floors. – The charging base needs to be placed in relative open area (Keep 3 ft / 1 m on the left and right side and 6 ft / 2 m in front of the charging base). -To support and charge the vacuum, please place the charging stand against a flat wall. – This carpet cleaner can be charged directly with its power adapter plug in the socket near the power switch. [ Quiet as whisper ]: less than 60 Decibels when using regular cleaning mode, finishing the “dirty” job without “known”. 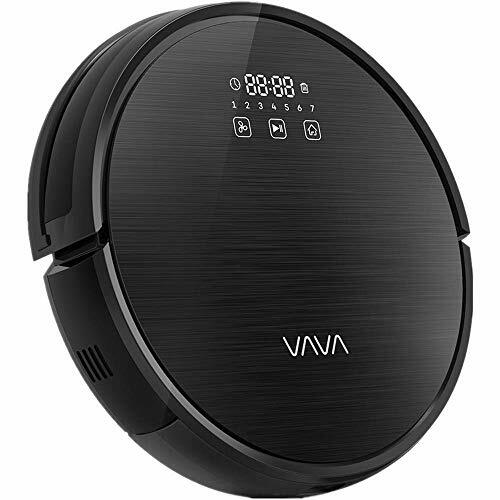 [ No More Worries ]: The VAVA Robot Vacuum Cleaner protects itself from falling or crashing with infrared and drop sensors; 18 month extended warranty. What’s in the Box: 1 x VAVA RoboDuster Robot Vacuum, 1 x Charging Base, 1 x Power Adapter, 1 x Remote Control, 1 x User Manual.